Previously, on MinerBumping... Our readers were animated by the spirit of the Code, growing ever more knowledgeable about our enemies. "CODE. used to be cool. Now, not so much." One of the New Order's most remarkable strengths is its endurance. Over the years, the New Order has weathered every storm. CCP has frequently attempted to nerf our chosen styles of play. Permabans (each hotly contested) have been placed on some of our finest gentlemen. On countless other occasions, our enemies have declared that the end of the Code must be imminent. And yet, through it all, we have only grown more powerful. What's the most deadly threat to the New Order? If you ask the Former Fan, the answer would be his own decision to turn against us. He was the Code's ultimate supporter, its biggest cheerleader. Now, after many sleepless nights and much soul-searching, the Former Fan has reached a grave conclusion: He must rescind his support and become a critic. It's a fatal, earth-shaking development. After all, the Former Fan's support had been indispensable to the New Order. The tide has truly turned. Oh, but there's one thing I forgot to mention: Until now, nobody has ever heard of the Former Fan. You see, the Former Fan isn't actually a former member of the New Order. He wasn't a supporter, either--at least, not as far as anyone was aware. The Former Fan popped up out of nowhere, claiming that he used to like CODE., but now he doesn't. If true, why wasn't his loud voice heard back in the good old days? He only came into existence at the moment he turned against us--the Former Fan has the worst timing! In reality, the Former Fan is an ordinary critic who despises his own ordinariness. He wants to lend extra weight to his (usually anonymous) words, so he casts himself in a more impressive and more important role. Unfortunately, the Former Fan sticks out like a sore thumb, because there's really no such thing as an actual critic of the New Order who used to be a supporter. Why? Because the New Order is rooted in the Code, and the Code is always the Code, always. Our consistency defies any incentive to switch sides. One doesn't hear, for example, D400 saying, "I liked it when CODE. used to kill pods. Now that they still kill pods, things just aren't the same." The Former Fan's lament about CODE. not being cool anymore is the rebel's equivalent of "EVE is dying." The difference is that one day EVE's servers will shut down, but CODE. will always be exactly as cool as it always was: the coolest! A question, dear reader: What's the most overpowered mechanic in EVE history? Perhaps it was the remote doomsday, or some other feature of the supercaps. Maybe you have memories of pre-nerf nano Dominixes or sentry carriers. All interesting choices, but none are the right answer. The most overpowered mechanic in EVE history--if it can be called a mechanic--is the Code. The Code is totally OP. Most every video game has some weapon or tactic that's overpowered. Players demand a nerf, and often get one. But not always. Sometimes it remains in the game, and it naturally attracts attention. What to do about it? Well, the old-fashioned "play to win" types will use the overpowered mechanic as much as they can. However, some players would much rather the mechanic not exist. Such a player refuses to use it, and he must try to persuade others to stop using it. He'll use every psychological tool at his disposal: Guilt, elitism, shame, hostility, whatever. He is the Manipulator. If only the Manipulator had access to the development team, or at least admin rights on a private server! Then he could remove the mechanic. Since he can't, he'll try to talk his fellow players out of using it. If he's lazy, though, he'll just call you "cheap" and ragequit. Much depends on the Manipulator's mood, because despite his manipulations, he is a creature of instinct. He doesn't really know what he's doing. His manipulations are almost entirely unconscious. Even so, the Manipulator can be successful. Many players have changed their ways solely due to pressure from a Manipulator or two. Recall The Marmite Collective, which was at one time the most statistically destructive alliance in EVE. With a handful of pilots, they wardecced everyone in sight and relentlessly camped Jita 4-4. They drove countless alliances to tears. In theory, The Marmite Collective's enemies could have teamed up and broken the Jita camp, but of course they didn't. The Marmites weren't defeated through PvP in the traditional sense; they were taken down by Manipulators who accused them of being lowly trade hub campers. Over time, the leaders of The Marmite Collective were worn down by the criticism. They internalized it. They sought to prove their elite PvP skill by relying less on their Jita 4-4 camps, which were dismantled, leading to the decline of the alliance's power. "We're not trade hub campers anymore!" they shouted with joy. But in truth, victory belonged to the Manipulators. They broke the Jita camps without firing a shot. The New Order has attracted more than its fair share of enemies in the mold of the Manipulator. They beg CCP for nerfs, but they also tell us to "shoot ships that can shoot back," or demand that we "go to lowsec," or "try to claim sov in null." They may as well tell us to stop being awesome. They encourage us to abandon the idea of the Code and simply perform random ganks. It's as if they know, unconsciously, that random ganks of miners have never gone anywhere in EVE. The Code is the source of our power. The Manipulator wishes it could be removed from the game. "There should be more consequences to ganking." Fortunate is the EVE player who discovers the Code for the first time when, to his great surprise, he sees local chat suddenly explode with activity. He knows that he was fighting off boredom before this happened. He might've been mining an asteroid belt or doing a low-level mission, or perhaps he was slowly making his way through a trade route. Absentmindedly, he glanced at the normally silent local window. Then everything changed. I suspect that I'm describing an experience familiar to many of my dear readers. They recall their reactions to seeing local come alive. First they were stunned, amazed. Then they were captivated. They couldn't tear their eyes away from local chat as it filled with the fulminations of angry carebears and the suave derring-do of a New Order Agent--clearly the absolute master of the situation. The witness to this spectacle dropped whatever he was doing. If he'd been passing through the system, he stopped on the stargate, unable to jump through. There was no reason to continue traveling, because right there, in that very system, he knew he'd found what he'd been searching for. This was EVE. Having experienced such a thing, the witness would find it almost impossible to believe that someone would want to nerf (or ban!) what the New Order was doing. He didn't yet know exactly what this "Code" was all about, but whatever it was, it was a good thing. For the Code was producing something that our witness would later come to know as "content". However, not everyone reacts the same way our witness did. There are those, in fact, who react in exactly the opposite manner. Like a mirror opposite from a parallel universe, the Content Hater watches the spectacle and feels disgust. He is indignant: How can this happen? How can it be stopped? The Content Hater is a character that I've described before as a "knee-jerker". Whenever something is happening, he wants it to be constrained or eliminated. Freighters are being ganked? Nerf freighter ganking. Miners are being bumped? Nerf miner bumping. Corps are being awoxed? Remove it. Cans are being flipped? Get rid of it in the next patch. For the Content Hater, content is a problem to be solved. He views any form of emergent gameplay as a kind of loophole--one which, now that it has been discovered, needs to be closed. Any creative use of the sandbox, anything not taught in the tutorial, is basically cheating. If the Content Hater didn't contemplate suicide ganks when he signed up for EVE, then it may as well be an exploit. Needless to say, the Content Hater hates the New Order. After all, we're the ultimate content creators of EVE. He'd rather be bored than see anyone else having fun. What a miserable fellow. The Content Hater. Gee have I met some of those in RL. You know, the people who never have a good word to say about anything, but must proscribe it themselves or try to persuade others to do so for them. They seem to live this very narrow life in which, should they stray even a whisker's width from their chosen path, the sky would surely fall in. Most of them are very unhappy, I believe. That is why - in EVE Online - we bring to them something with proven efficacy in dispelling the clouds of that unhappiness; The Code! inb4 your fanboi comes to tell you "shut up". He must love you very much. This is all bull****! 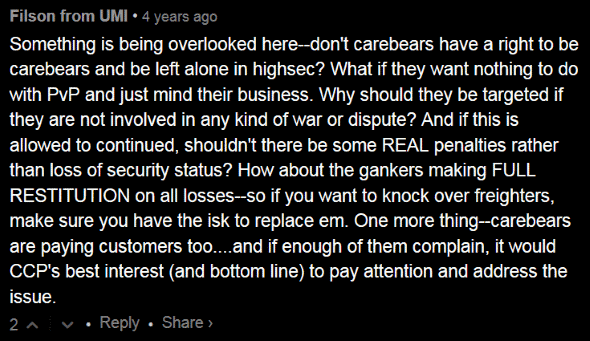 Lol you can make excuses for ganking like its content or we are recriuting but all ganking is only griefer playstyle! Lol eve used to have 400k players now you can only find 20k online at once, and ganking is the reason it is dieing lol. Powerful players like jita trader have given me skill injectors and isk to show they are not afraid of you anymore lol. Karmakid can bring all the gankbios out to Hageken lol. You cant suicide gank a citadel like a bunch of ISIS wannabes lol. The sperg is strong with this one. If only the skill injectors could be applied to an actual human brain , maybe this guy could be considered competent. You just can't make this up can you? Lol. These russian jita traders are selling these kids drugs in our system and look at the effect its having on them. Its time to clean up the streets. Winners don't do drugs. wait...FOUR HUNDRED THOUSAND????!!!! you really believe eve could support 400k players? and lets not forget that the average number of logged on players is 30 thousand, and much closer to 37-40k on the weekends, when the adults get their days off. if you would like to include on your stream some example of "griefing" im sure eve would love to see it. Wah wah wah wah wah wah. Lol cry cry cry. Im not having fun so why should you. this is so good. praise james!